With an airy atmosphere and plenty of space to relax, this beach getaway in Galveston will fit your family just right. Get some fresh air on the deck before heading down to the beach for the afternoon. This family-friendly condo offers games and toys for kids, baby gates, and a high chair. 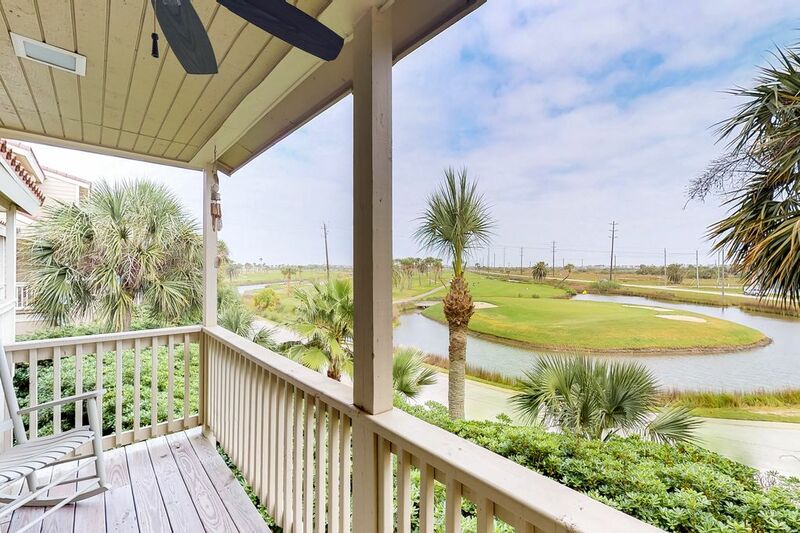 The Galveston Country Club is right behind this condo, making it easy to tee off on their beautiful golf course. Make your way over to the other side of the island, about a mile's drive, for an afternoon on the beach with the rental's provided beach chairs. The full kitchen equips you to make your family's favorite meals, which you can enjoy at the breakfast bar. Free WiFi and Netflix streaming provide your group's entertainment during your stay. This place is a great option for snowbirds, too, and offers a fireplace for use during winter visits. Reserve your spot at this wonderful condo today! *Please note, there are two sets of stairs inside this condo. Parking Notes: No parking on Dana Drive. This place was fantastic! Clean and with excellent amenities. We enjoyed our weekend stay while in town for a cheer competition. The space was clean, cozy and decorated super cute! We would love to stay again. The condo was just what we needed for our trip to Galveston for a nephew's wedding. Nicely decorated, very comfortable and well supplied with all the necessities. Perhaps a small dresser of some type in the one bedroom with a closet. As noted in previous reviews, this unit is three stories, which was no problem for us, but could be a challenge for other families. We would certainly return to this cute condo! Thank you! Enjoyed the beach decor and this quiet retreat for our vacation. Would highly recommend! I loved it will for sure be back next year ..